January 2016 67 "The patio around the pool was stamped concrete that did not match all the other stone work," Cloonan said. "The cabana was poorly designed and did not function well." In the design phase, it became more and more apparent that the pool area and cabana would need to be completely redone, so they would align well with the rest of the new look. Cloonan said he tried many concepts of incorporating the existing pool and cabana into his new scheme, but nothing worked. After seeing these sketches, his client decided to demolish the existing 12-year-old pool and replace it, and to extensively remodel the cabana. "So now my creativity was released," he said. "I no longer had to work within the footprint of those who had gone before me." A resort-like atmosphere was what his clients wanted, and Cloonan and his team of contractors and subcontractors delivered in a big way. Soon after construction began, Cloonan's clients went on a shopping spree to New York, and they came home with a gigantic swing. The problem was, "We had nowhere to hang it." After a brainstorming session, Cloonan and his team came up with a novel idea. "Let's build a tree," he said. And that's what they did. "I started by drawing a concept of the tree and then found someone to build it," Cloonan said. "After 10 pages of design and 38 pages of engineering — we did it!" "The tree was not part of the scope of the work in the beginning," he said. Above Two large faux olive trees were designed for the pool area planters. Olive trees were chosen because they have "amazing spiritual significance" and are mentioned dozens of times in the Bible, Cloonan said. Planters were constructed specifically for these trees. 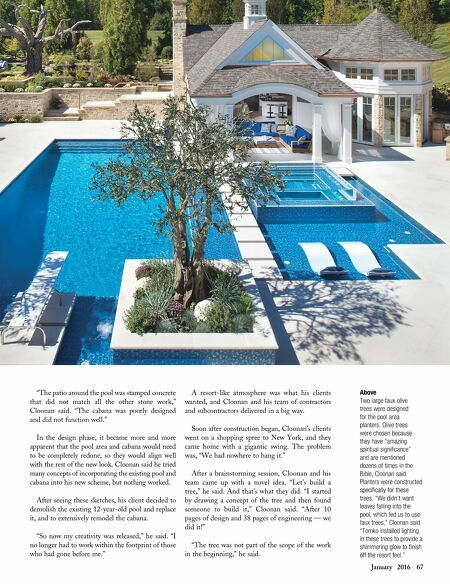 "We didn't want leaves falling into the pool, which led us to use faux trees," Cloonan said. "Tomko installed lighting in these trees to provide a shimmering glow to finish off the resort feel."